How do you avoid losing track of your prospects during the sales process? Get them to agree on next steps at the end of each meeting. Do you have a system for insuring your relationships with prospects are continually moving forward toward a buying decision? In other words, are you and your prospect always on the same page, consciously moving forward together? Or do you make the common mistake of approaching the sales relationship haphazardly without knowing where it is going or even where it should go? Rather than shooting from the hip and making follow-up calls to prospects without having an idea of how or why to call, try turning the sales process into an organized and logical progression—like a stairway—with clearly defined steps that provide comfort and value to both you and your prospect. Unless you’re engaged in a one-meeting sale, your sales cycle will require you to maintain contact with prospects over an extended period of time before a sale can be consummated. You know you will have to follow up with additional information, more meetings, a needs analysis, a proposal, etc., so be prepared to carry the relationship forward. Know at each stage exactly what your next move should be. The key to building your sales process is to have your prospect agree on the next move before the end of each meeting, and in order to do that you must know both what the logical next move for the particular prospect is and where that move is going to lead in the sales process. Never leave a meeting without agreeing on what will happen next and when it will happen. You don’t have to be like the majority of salespeople who struggle to keep in touch with their prospects and move them along in the sales process. 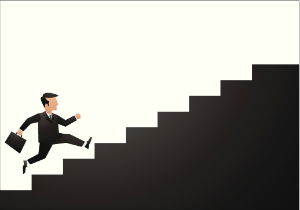 Instead of worrying about what to say, when to make contact or how to get your prospect to move along the process, simply follow your sales staircase step by step until you reach the top.